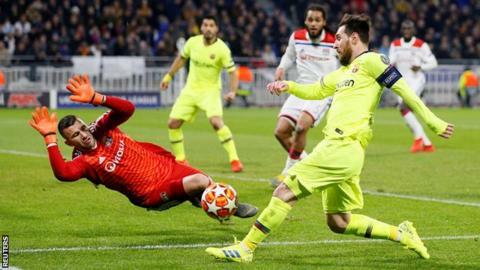 Usually so proficient in front of goal, Barca's Lionel Messi, Luis Suarez and Phillipe Coutinho were all denied by Lyon goalkeeper Anthony Lopes. Lyon had chances, too, but Marc-Andre ter Stegen brilliantly tipped Martin Terrier's long-range shot onto the bar. Champions Barca are top of La Liga, seven points clear of second-placed Atletico Madrid, but they have not won Europe's premier competition since 2015 when they defeated Juventus in the final. Going into this tie, Ernesto Valverde's side were heavy favourites to progress to the quarter-finals for the 11th consecutive season, but their poor finishing leaves the tie in the balance. When Barca did call on Lopes, they found the Lyon number one in superb form, springing high in the second half to tip over Sergio Busquets' drive, the best of his five saves in the game. French club Lyon, the only side to beat runaway Ligue 1 leaders Paris St-Germain this season, could have snatched a goal themselves but Houssem Aouar's strike was pushed away by Germany international Ter Stegen and Memphis Depay screwed a shot wide from the angle. Barcelona are winless in their last six Champions League away knockout games (D2 L4), failing to score in five of those. Lyon have drawn each of their last six Champions League games, equalling the record for most consecutive draws in a single Champions League season along with AEK Athens (2002/03) and Rangers (2005/06). Lyon have failed to beat Barcelona in all seven of their Champions League clashes (D3 L4). This was the first time since 15 March, 2016 that two Champions League knockout matches finished 0-0 (Atletico Madrid v PSV and Manchester City v Dynamo Kiev). Barcelona's Lionel Messi attempted nine shots in this match, four more than Lyon registered. It's the joint-highest total without scoring for a player in this season's Champions League (also Luis Suarez v Inter in Nov and Cristiano Ronaldo v Valencia in November). Suarez has gone over 24 hours of playing time since he last scored an away goal in the Champions League (1508 mins). Lyon failed to land a single shot on target in the second half, attempting just two across the whole game. Gerard Pique became the seventh player to reach 100+ appearances for Barcelona in the Champions League (also Xavi, Lionel Messi, Andres Iniesta, Carles Puyol, Victor Valdes and Sergio Busquets). Match ends, Lyon 0, Barcelona 0. Second Half ends, Lyon 0, Barcelona 0. Attempt missed. Luis Suárez (Barcelona) header from the left side of the six yard box is high and wide to the left. Assisted by Lionel Messi following a corner. Attempt missed. Lionel Messi (Barcelona) left footed shot from the centre of the box misses to the left. Assisted by Luis Suárez following a corner. Attempt saved. Sergio Busquets (Barcelona) right footed shot from outside the box is saved in the top centre of the goal. Assisted by Lionel Messi. Substitution, Barcelona. Arturo Vidal replaces Sergi Roberto. Sergi Roberto (Barcelona) is shown the yellow card. Attempt missed. Jordi Alba (Barcelona) left footed shot from outside the box is close, but misses the top right corner. Assisted by Luis Suárez. Attempt saved. Coutinho (Barcelona) left footed shot from outside the box is saved in the bottom left corner. Assisted by Luis Suárez. Substitution, Lyon. Maxwel Cornet replaces Martin Terrier. Attempt missed. Luis Suárez (Barcelona) left footed shot from the centre of the box is close, but misses to the left. Assisted by Jordi Alba. Substitution, Lyon. Lucas Tousart replaces Bertrand Traoré. Attempt missed. Lionel Messi (Barcelona) left footed shot from a difficult angle on the left is just a bit too high. Assisted by Jordi Alba. Attempt saved. Lionel Messi (Barcelona) left footed shot from the left side of the box is saved in the centre of the goal. Assisted by Ousmane Dembélé. Attempt blocked. Luis Suárez (Barcelona) right footed shot from the centre of the box is blocked. Assisted by Lionel Messi. Offside, Barcelona. Jordi Alba tries a through ball, but Ousmane Dembélé is caught offside.